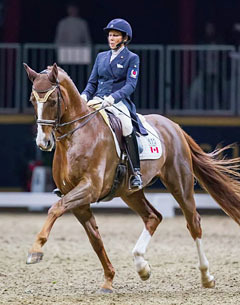 Canadian Olympian Megan Lane of Collingwood, ON, won the $20,000 Royal Invitational Dressage Cup on Thursday 10 November 2016 at the Royal Horse Show, held as part of the 94th Royal Agricultural Winter Fair in Toronto, ON. Fresh off their Olympic debut this summer in Rio de Janeiro, Brazil, Lane and her mount Caravella made their inaugural Royal Horse Show appearance a winning one. The Royal Invitational Dressage Cup is a Canadian, national competition for which the riders are selected by invitation. On Thursday night, Lane and Caravella performed their freestyle, where riders choreograph required movements to the music of their choice, in front of a packed house in the Ricoh Coliseum. Riding to an original composition by Dutch freestyle designer Joost Peters, Lane had a freestyle highlighted by impressive flying changes, piaffe and one-handed pirouettes. The panel of international judges rewarded the pair with a score of 76.75%, giving Lane the victory in her Royal Horse Show debut. Lane has been partnered with Caravella, her 15-year-old Canadian-bred mare, since she competed in the junior divisions seven years ago. With the Pan American Games and the Rio Olympics checked off her list, Lane is now aiming Caravella towards the 2017 World Cup Final in Omaha, Nebraska, next spring. Having also won Wednesday’s Grand Prix with a score of 71.63%, Lane was presented with the Butternut Ridge Trophy, generously sponsored by Deborah Kinzinger Miculinic. “Thank you to all of the sponsors for making this happen and to everyone who came out to support Canadian dressage tonight!” said Lane. Finishing as the runner-up in Grand Prix Freestyle was Lane’s Pan Am Games teammate Brittany Fraser-Beaulieu of Ottawa, ON, riding All In, an 11-year-old Warmblood gelding, with a score of 75.250%. Jacqueline Brooks of Mount Albert, ON, was third with a score of 72.708%. In a poignant moment, Brooks performed her freestyle to Leonard Cohen’s ‘Hallelujah’ riding her 2012 Olympic mount, D Niro, a 17-year-old Swedish Warmblood gelding owned by Mary Brooks and Brookhaven Dressage, Inc.
Finishing in fourth in the impressive line-up with a score of 68.50% was six-time Canadian Olympian Boylen of Schomberg, ON, riding Drentano, a 13-year-old Hanoverian gelding owned by Kinzinger Miculinic.